TJ Hughes: Out of time!! We can't believe it's almost the end of September, where does the time go?? Before we know it Christmas will be here again and we will be fighting in the aisles for that last turkey or rushing around on Christmas Eve to find the perfect gift for Auntie Ethel. Why not make a change this year and get organised? Write a list of everyone you need to purchase a gift for and the budget for that gift next to it (yes we know it looks scary when you see how much it's going to cost!!!) and then start planning out your remaining pay days and what gifts you need to buy each month. 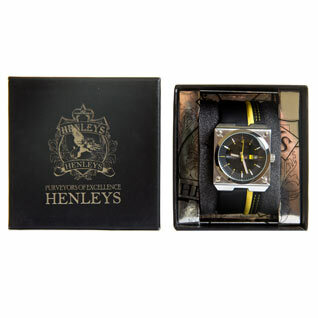 We love it when we get a deal on our Christmas gifts and these Henley watches are definitely ticking that box. These mens watches are just £14.99 each and we promise we won't tell anyone how little you've spent. Think how great you'll feel ticking that first name off your list and knowing you haven't blown your budget. This stylish Roll 2 watch has a metal alloy bracelet and fastening. The fashionable square face has a black dial with orange second hands, there is also a date window at the 3 o clock position. This watch has a smooth quartz movement, has scratch resistant glass and is water resistant up to 30 metres. 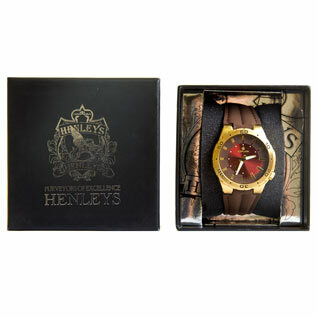 This Fly watch is a traditional style but with a thoroughly modern twist. The soft brown leather strap has a wonderful feel of quality and the classic dial has a touch of the contemporary. This watch also has quartz movement and scratch resistant glass and is water resistant to 3 metres. The Grid 2 watch has a black leather strap with a flash of yellow stitching to add to the contemporary look. This watch has quartz movement and the square bezel face is protected by scratch resistant mineral crystal glass. This watch is water resistant to 30 metres. 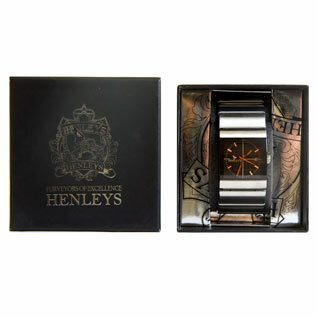 The Henleys Sunset dial watch has a stunning sunset dial surrounded by a gold coloured alloy casing with scratch resistant glass. 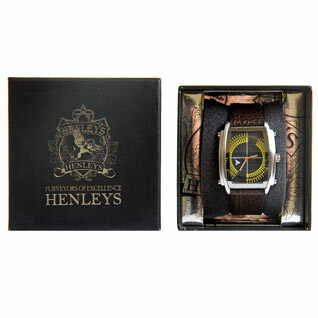 It is completed with a classic soft brown leather strap which has a fantastic feel of quality. With watches this stunning and at this price what are you waiting for? ?